I have a long history of painting this barn dating back to when I first started watercolor painting fourteen years ago. Since then, I've done five large paintings of it. The first three sold immediately, the last two were commissions for the owners. But I've never before painted it in the snow, so this one is a first. An early snow has blanketed the ground and covered the barn. The pond had not yet frozen during the storm so it is clear of snow, but a very thin sheet of ice is forming. If the weather stays cold enough for the ice to reach several inches thick, it will make a nice smooth surface on which the farm children can skate. I like how the snow-covered grasses in the foreground look sparkling and icy. Sometimes watercolors give the painter a happy surprise and that is one of them! This 5x7 inch painting is matted to 8x10. 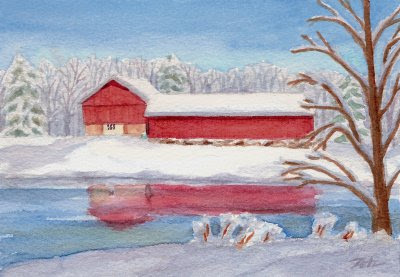 Check my website for Red Barn in the Snow to see if it's available.